Consider a scenario where you need to listen to Azure resource events happening in one Azure subscription from another Azure subscription. A use case for such a scenario can be when you are developing a solution where you listen to events happening in your customers’ Azure subscriptions, and then you need to handle those events from an Azure Function or Logic App running in your subscription. 1. Create an Azure Function in your subscription that will handle Azure resource events received from Azure Event Grid. 2. Handle event validation in the above function, which is required to perform a handshake with Event Grid. 3. 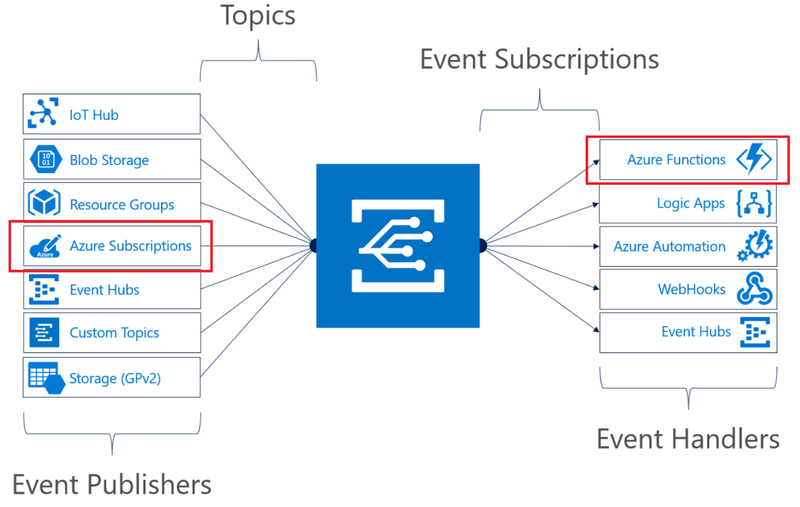 Create an Azure Event Grid subscription in the customers’ Azure subscriptions. Before, I go into details let’s have a brief overview of Azure Event Grid. Azure Event Grid is a routing service based on a publish/subscribe model, which is used for developing event-based applications. Event sources publish events, and event handlers can subscribe to these events via Event Grid subscriptions. You can listen to these events by creating an event handler. Azure Event Grid supports several Azure Services and custom webhooks for event handlers. There are number of Azure services that can be used as event handlers, including Azure Functions, Logic Apps, Event Hubs, Azure Automation, Hybrid Connections, and storage queues. In this post I’ll focus on using Azure Functions as an event handler to which an Event Grid subscription will send events to whenever an event occurs at the whole Azure subscription level. You can also create an Event Grid subscription at a resource group level to be notified only for the resources belonging to a particular resource group. The figure 1 posted above, shows various event sources that can publish events, and various supported event handlers. As per our solution Azure subscriptions and Azure Functions are marked. When an Event Grid subscription is created, it sends a subscription validation event in a POST request to the endpoint. All we need to do is to handle this event, read the request body, read the validationCode property in the data object in the request, and send it back in the response. Once Event Grid receives the same validation code back it knows that endpoint is validated, and it will start delivering events to our function. Following is an example of a POST request that Event Grid sends to the endpoint for validation. Our function can check if the eventType is Microsoft.EventGrid.SubscriptionValidationEvent , which indicates it is meant for validation, and send back the value in data.validationCode. In all other scenarios, eventType will be based on the resource on which the event occurred, and the function can process those events accordingly. Also, the resource validation event contains a header aeg-event-type with value SubscriptionValidation. You should also validate this header. Following is the sample code for a Node.js function to handle the validation event and send back the validation code and hence completing the validation handshake. While creating the Event Grid subscription, detailed in next section, it should be created with the endpoint URL pointing to function URL including the function key.. Also, event validation done for the handshake acts as another means of authentication. To add an extra layer of authentication, you can generate your own access token, and append it to your function URL when specifying the endpoint for the Event Grid subscription. Your function can now also validate this access token before further processing. A subscription owner/administrator should be able to run an Azure CLI or PowerShell command for creating the Event Grid subscription in customer subscription. Important: This step must be done after the above step of creating the Azure Function is done. Otherwise, when you try to create an Event Grid subscription, and it raises the subscription validation event, Event Grid will not get a valid response back, and the creation of the Event Grid subscription will fail. You can add filters to your Event Grid subscription to filter the events by subject. Currently, events can only be filtered with text comparison of the subject property value starting with or ending with some text. The subject filter doesn’t support a wildcard or regex search. Here https://myhttptriggerfunction.azurewebsites.net/api/f1?code= is the URL of the function app. Instead of asking customer to run a CLI or PowerShell script to create the Event Grid subscription, you can automate this process by writing another Azure Function that calls Azure REST API. The API call can be invoked using service principal with rights on the customer’s subscription.